Even the perception has changed. There was a time when Tyrone was talking about just winning one game to break a losing streak, or winning three games, or just winning a district game. But after going 6-4 last season, they’re thinking playoffs at the Class C eight man school. 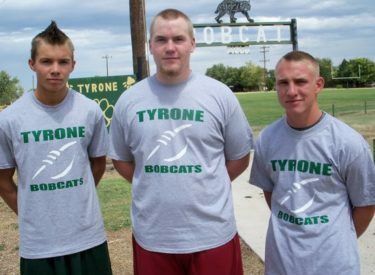 Coaches Aid picks the Bobcats third in the district and folks in Tyrone are hoping perception becomes reality. There is reason to believe the Bobcats will be good. Eighth year head coach Josh Bell says his team has more team speed and more size up front. Big junior lineman Dalton Robinson, junior center Jose Garcia, and sophomore Conrad Brockett anchor the line. Travis Shield has put up eye popping numbers since his freshman year. Shield returns at running back and linebacker but will miss the opener because he is recovering from knee surgery. Freshman Gage Schoolcraft will fill in for Shield in the opener. Junior quarterback and cornerback Cole Wall takes over at quarterback and Tyler Lai graduated. Tyrone has 18 players out for football after going 3-7, 4-5, and 6-4 the past three seasons. The Bobcats will be featured during the Sportsguys Wednesday morning between 7:37 and 9 on Talkradio 1270 and kscbnews.net.